Billion Dollar Babies is not a reincarnation of Alice Cooper's band that broke with him back in 1974. However, it is quite possible this Swedish rock band did acquire some inspiration from that most famous Alice album. Also, contrary to their promotional material, BDB is not a mix of KISS and Motley Crue. The closet to the former maybe the song Nineteen Ninety For, and to the latter, well, probably nothing, but We Don't Live Forever has some swagger. Mostly Die for Diamonds seems more like a merger between late 70's and mid-80's melodic rock, swinging between AOR and edgier hard rock. Boys Night Out (the first single), Highest Mountain, and the forever catchy Restless Mind remind more of accessible 'pop-like' melodic rock, not gritty Sunset Boulevard. However, BDB can get darn close as on the fast and catchy Lose It and the aforementioned We Don't Live Forever. Key to My Heart and Right on time have that same pop sensibility, with some piano based boogie, in an arena rock wrapper. In terms of simple song craftsmanship and musicianship, Billion Dollars Babies are quite talented. All the songs are well-composed, well-played, and will pull you in. At times the tone of Billion Dollar Babies' music reminds me of Swedish cousins The Poodles, yet with a more pedestrian rock vibe. The beat, melody and groove appointed with some slick guitar solos make substance Die for Diamonds rather substantial and infectious music. Recommended. 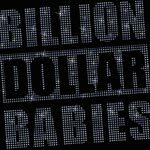 In terms of simple song craftsmanship and musicianship, Billion Dollars Babies are quite talented. All the songs are well-composed, well-played, and will pull you in. The beat, melody and groove appointed with some slick guitar solos make Die for Diamonds rather substantial and infectious music.